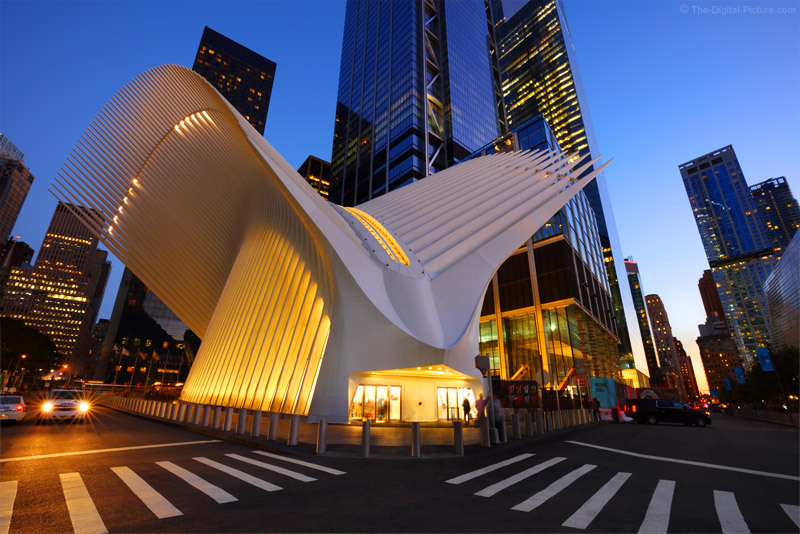 The World Trade Center Transportation Hub, or "Oculus", is a relatively new addition to New York City and, immediately upon seeing the unique architecture of this structure, looking something like a monster coming out of the streets of the city, my to-do list grew one line longer. I was in the city for the PhotoPlus Expo and with the expo closing at 5:00 PM on weekdays, I always have time to go to a location not too far away, do some quick scouting and set up for a blue hour photo shoot (especially if I cut out of the show a little early). This year, I made that location the WTC Transportation Hub. Upon arrival, I walked around the hub, looking for the best photographic angles with blue hour imagery being my primary objective. You are now looking at one of my favorite images coming out of that effort. The first concept to share here is that the ultra-wide 16mm full frame focal length allowed me to get close enough to frame the entire structure without obstructions and because I was close and the hub was the closest building, perspective made it appear large relative to the other buildings. I included the crosswalks in the foreground because I liked how they balanced with the fins of the hub. Along with the crosswalks come a pair of streets that nicely frame the hub. Another key to lack of obstructions in the frame came from the multiple-frame 8-second exposure composite. Moving people were blurred out of view during the exposure and those not moving were often in a different location in another frame captured just before or just after the primary one. The longer exposures come naturally when the sky starts getting darker and balancing with the lights (though a neutral density filter can also be used). The narrow f/16 aperture also helps extend the exposure time. I didn't need f/16 for the deep depth of field it provides, but in addition to extending the exposure duration, I like the starburst effect f/16 creates from bright lights, such as those on the police car on the left side of the frame. And that brings me to another point. Before you attempt to recreate this image, check on the tripod rules for this location. As I was capturing the last frame included in this composite, with the tripod legs set narrow, between my feet (for both safety and courtesy reasons), the police officer drove over and stated "This is New York City. Tripods are not allowed on public property." Well, I have read (and experienced) otherwise, but ... some jurisdictions have their own rules (I'll have to research this one). I was tired, not interested in creating an issue and ... I already had the image I wanted. So, I moved on, though wishing that I had brought my Feisol TT-15 Mini Tripod along to make subsequent images significantly easier to capture.